After 30 years of working on resources for parents & children, Rick began to see that unless a parent had been made into a disciple of Jesus first he or she could not pass their faith on to their children effectively. So in 2011 he began seeking God and studying the Bible about how to “make disciples” of adults. Not long into his pursuit, the Lord began to reveal the biblical model for making disciples and how Jesus teaches and transforms us through God’s Spirit at work within us. Rick then knew that the Lord was calling him to not only help the Church equip parents to make disciples of their children, but also to aid the Church in making disciples of everyone. Rick is now working hard on producing the resources that will equip the local church to do both. It is Rick’s desire to see the body attain the whole measure of the fullness of Christ. 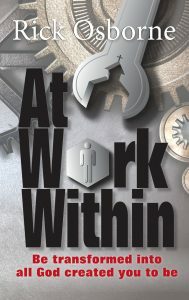 We hope that after you read At Work Within, you will begin your own transformation journey into the image of Jesus.